Fridge empty? You can still have a healthy meal! After a long day at work and a commute that sometimes seems just as long, there’s no joy in coming home and facing the reality that there is absolutely nothing to eat for dinner. Frustrated, you’re now wondering what could be realistically turned into dinner without too much effort since you are exhausted and simply wish to sit in the ole’ recliner to “chill” for a bit. You remember that there is a carton of ice cream in the freezer and a bag of your favorite potato chips in the cupboard… and they are both so tempting. Both are easier options than preparing a healthy meal, but will most likely leave you feeling a guilty later. So tell me, what will your choice be? Before you do that, can I tempt you with a third option? What about finding a way to fabricate a dinner that is healthy for you and that is simple, not time-consuming or complicated? It will take a bit of planning ahead; you’ll want to make sure to have some ingredients in your kitchen that will allow for these meals to be assembled stress-free. Does that sound good? Thought so! Chopped Salad. Chop up a variety of your favorite vegetables, drain a can of beans, throw in a handful of nuts, sprinkle in some grated cheese, corn kernels, chopped avocado and a few crunchy croutons and there you go! You can also prepare a hot salad by sautéing your favorite vegetables (broccoli, sugar snap peas and fingerling carrots are my favorites) and add a little grated cheese. Salad, soup and bread. Pre-washed / pre-chopped greens and any variety of fresh veggetables along with low-fat dressing or bottled olive oil vinaigrette. Throw together a tossed salad. Soup which is not loaded with sodium or fat can be found in a can and are great for last minute meals. A slice of whole-wheat bread or a serving size of whole grain crackers, and you have a delicious dinner. Sandwiches. Chicken, turkey or tuna with a couple thin slices of cheese along with some sliced tomatoes, lettuce, cucumbers, avocado, sprouts and two slices of whole-grain bread with a little mustard and you have a healthy meal. Grilled sandwiches are also a great option. Start with two slices of whole-grain bread, a couple slices of your favorite cheese and then add vegetables like tomatoes or even slices of fruit like pears of apples. Brush the pan with olive oil to keep it from sticking. And don’t forget the old standby: peanut butter and jelly (low sugar fruit preserves) on whole-wheat bread – my favorite! Eggs. Sauté some of your favorite vegetables (bell peppers, mushrooms, onions are great) and pour a couple of scrambled eggs over them. Cook on low heat until the eggs are done. Add a small amount of cheese and enjoy. Burritos or wraps. Simply open a can of no-fat refried beans, then grate some cheese, add salsa and some chopped vegetables of your choice. Some suggestions are: zucchini, tomatoes, onions, bell peppers, hot peppers, potatoes, broccoli. Try something new and use ingredients such as hummus and fresh vegetables like sprouts, cucumbers, avocados and tomatoes. Pasta: boil some whole-grain pasta (keep an eye on that portion size) open a bottle of marinara sauce and sprinkle on some freshly grated cheese. 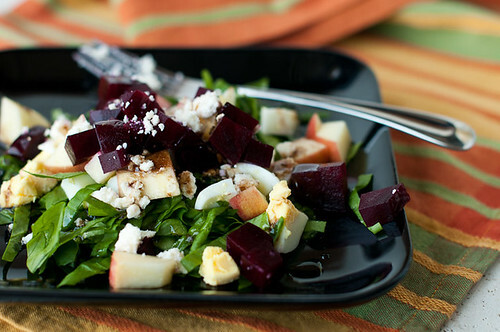 Include a small green salad and a piece of fresh fruit. Cereal. Simply grab a box of your favorite whole-grain cereal (preferably with less than 10 grams of sugar per serving) and milk with fruit. Another options is making a bowl of oatmeal, which contains fiber and antioxidants along with offering offers many health benefits from protecting our hearts to preventing cancer and diabetes! Quick grab items: Greek yogurt, fresh fruit or veggies, granola bar, they are simple items that you can keep in your kitchen at all times and they are healthy options. As far as the ice cream and potato chips … let’s just stay I refuse to keep them in my house. If you don’t buy them then you won’t be tempted by ‘em! What ideas can you share that makes your dinner solution easier?